Life doesn’t always go as planned. That doesn’t mean it can’t take a great turn. This year’s Rookie of the Year, Patrick Regna, had plans of being both a fire investigator and a professional soccer player. When neither of those materialized, he worked a 9:00 – 5:00 corporate job for five years. 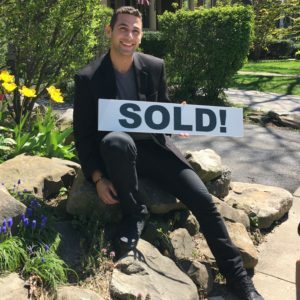 He felt cramped and knew he had “so much more to offer to people.” That’s when he made the choice to go into real estate. How would you describe your first two years in the business? “Year 1 – Information overload. Year 2 – Everything changed.” In the second year, Patrick said he began to absorb the information which gave him welcome free space in his head. He started to feel like he knew what he was doing. Patrick’s advice #1: Get a fantastic mentor. Patrick’s advice #2: You have to have faith and confidence in yourself and trust the process. Patrick enjoys the competitive nature of the business after playing sports most of his life. He is happy to have competition back and to be able to help people at the same time. Patrick’s advice #3: Listen to people. Let them talk. Don’t push people. Patrick’s advice #4: Don’t do it for the money. Do it to help. Be genuine. Be honest. The money and everything else will follow. Patrick looks forward to mentoring others in the coming years as he continues to learn.